Preheat oven to 325F Mix 3/4 cup of the sugar with a few Tbsp of water to moisten the sugar. Heat over low heat - once the sugar dissolves, bring to a rapid boil. Cook for 5 to 7 minutes until caramelized. Quickly pour the caramel into the mold, and coat all sides before it hardens. In a separate pot, bring the coconut milk, cream, and vanilla extract to a boil. Remove from heat, cover and let set for 5 minutes. Blend the remaining sugar into the eggs until the sugar dissolves. Stir in the milk/cream mixture. Strain through a sieve to get rid of the chalazae to make a smoother Cream Caramel. Add the coconut to the mixture. Pour the mixture into the mold and bake in a bain-marie for 30 minutes or until the center is set. Allow the Cream Caramel to cool to room temperature and chill in the fridge for 4 to 5 hours. Making the Chocolate Caramel: Ingredients: 1 1/4 cups Sugar 1/2 cup Syrup 2 oz Chocolate Cook the sugar and syrup in a pot until it reaches 315F. Add the chocolate and slowly mix into the caramel. Pour onto parchment paper and allow it to cool. Making the Chrysalis: Sorry for lack of photos, but I only have a few seconds to work with the chrysalis before its harden. Preheat oven to 325F and place the cooled caramel on a parchment lined pan. Cook until it melts. Spread the mixture between two sheets of parchment and cut into rectangles the length on the Cream Caramel. 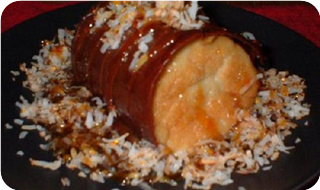 Remove the Cream Caramel from the mold and roll the chrysalis around it. Let cool.